TROPICAL style living at the Elite gated Waterfront Community of The Shoals! Contemporary Corner Unit 3 BR, 2.5 BA residence with a KEY WEST VIBE offering morning SUNRISES & evening SUNSETS! SUN DRENCHED End Unit with PRIVATE ELEVATOR, Porcelain Tiled floors, engineered wood & newly carpeted bedrooms. Spacious & Open main level Great Room / Dining Room combo with high ceilings & plenty of windows & sliders for natural sunlight - FL living at its FINEST! The Balcony off the living area overlooks the pool & has a view of the Gulf! SLEEK eat in Kitchen with breakfast bar adorned with Granite Countertops, stylish Backsplash & Stainless Steel Appliances with an adjacent cozy Dining nook! Upstairs, the Spacious Master Suite has a private balcony, walk in closet and SUMPTUOUS Bathroom together with 2 generous sized secondary LIGHT FILLED Bedrooms with vaulted ceilings, balcony with view of the Bay, inside utility with W/D and Transom Windows! The OVERSIZED 2 Car Tandem Garage with storage & add'l 2 Car Carport is a bonus! 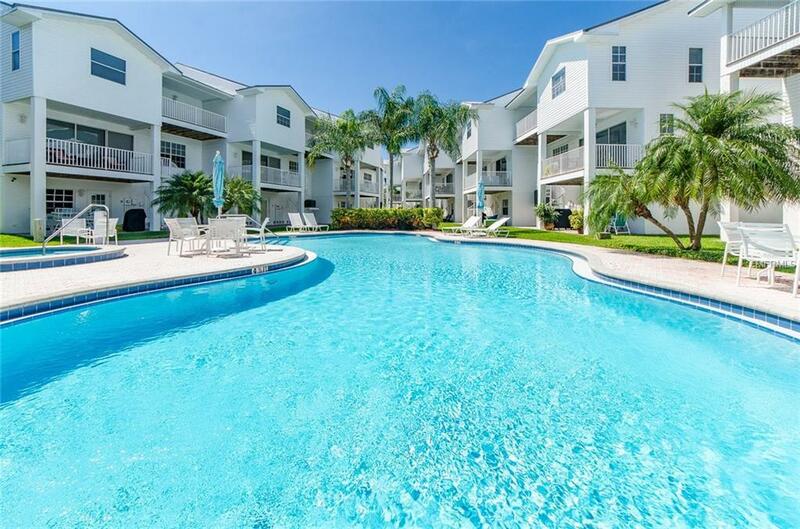 Slip into the RESORT STYLE Private Community Heated Pool & Spa in the center of the complex or Fish off your own PRIVATE DOCK on the Intracoastal! Walk to the neighboring Municipal Park or the beach providing a recreational space for the family where you can relax, swim, sunbathe or play tennis! PET FRIENDLY and PRIVATE GATED complex with LOW maintenance fees and just STEPS to the Beach! Live in the Land of the Tanned! Small intimate 19 Unit Complex just one block from the Beach! Additional Water Information The Shoals Community is A Waterfront Community With Private Dock For Fishing.